"It's difficult to explain how grateful I am to Habitat for Humanity Mid-Vancouver Island. They're helping people that have basically lost all hope, that have resigned themselves to living in poverty and never getting ahead." In late 1997, a property with a house was found on Rosehill Street in Nanaimo that would allow the construction of a duplex. 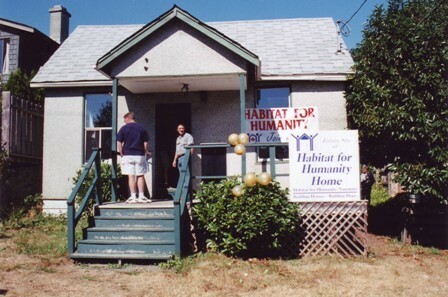 After much fundraising efforts, the first Habitat for Humanity Mid-Vancouver Island property was purchased in May 1998 for $75,000. In September 1999, demolition began on the old house on the property in preparation for the construction of a duplex. Habitat Mid-Vancouver Island teamed up with the Human Resources Development Corporation where six displaced fishermen did the carpentry work and Allen Gough, with a long history in the construction trade in Nanaimo, took the role of Project Supervisor, responsible for coordinating all aspects of the duplex. Materials for the new duplex were donated and construction was carried out by volunteers.